1. $200 security deposit (per day damage/cleaning/late) required when picking up key. Check returned if pass final inspection. 2. Unloading time at hall / shelters / campground is 15 minutes. 3. Vehicles moved to parking lot after unloading. 4. People requiring assistance may be driven to rented facility. 5. Music ends at 9 p.m. Cleaning should start earlier. 6. Dining hall must be clean and ready for next guest by 10 p.m. on final day of reservation. Lights off, building locked and key to office by 10 p.m. each day of rental. 7. Brooms and pails located in closet off kitchen. 8. Garbage bags provided. Set used bags outside of building on sidewalk. 9. Nails and staples not allowed. 10. Be responsible with balloons due to ceiling fans. 11. Pets not allowed in building. 12. Tents require approval by the park manager. 13. Refrigerator with top freezer. 14. 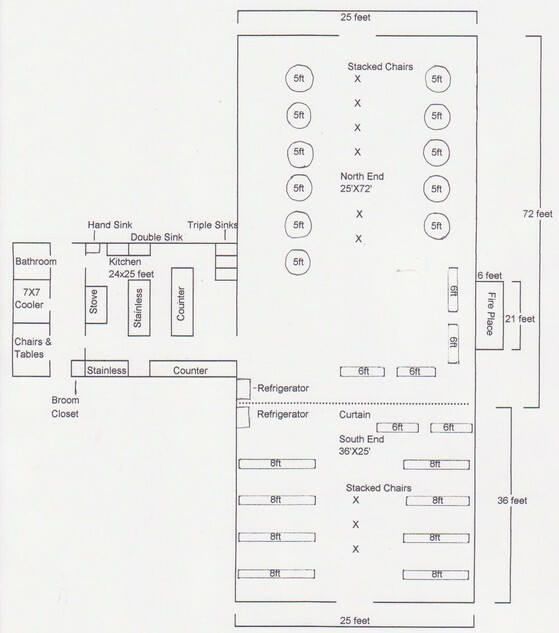 Kitchen: walk in cooler, gas stove/oven, refrigerator, dishtowels, (250-8 and 9 inch) plates. WestBend 60 & 100 cup coffee makers. 15. Gas heater and fireplace in dining hall area. No A/C. 16. Chairs and tables STAY in building. 17. Curtain in hall cannot be used for hanging items on or taken down. Either scenario will be considered damage and forfeiture of $200 deposit. 18. Gas stove & microwave (2017). Photos on Facebook. 2 ovens 2 racks. Extra tables and chairs can be put in a storage area off the kitchen.